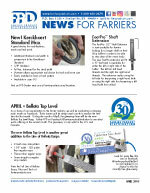 FPD, Inc. believes farrier organizations serve an important role in the equine industry. These organizations, located in North America and around the world, provide tremendous opportunities for learning and improving the horseshoeing industry. Educating and improving the skills of today’s farrier is central to improving the quality of hoofcare. In support of their efforts, FPD contributes financial and other forms of assistance to many associations. If you have any questions regarding programs, memberships, or the benefits of these associations, please contact them directly. We have included the names and contact information for many of these associations. If you know of any associations we have missed please contact us. Click here to send updated information. This service is provided at no cost to the associations. Please support your local and national farrier organizations.